Happy Weekend/Happy April! Can you believe another month has flown by already? 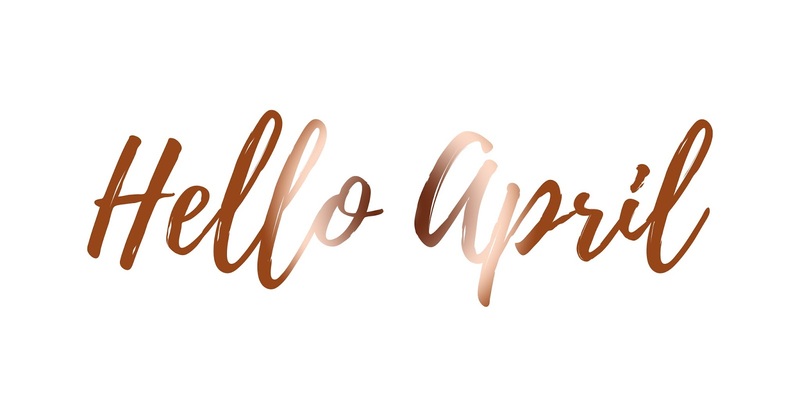 It feels like yesterday I was writing up my Hello March post. So I know Saturday's are usually the days for Student themed posts, but of course the first post of a new month rules over this. The best way to start off a new month is by going onto half term at the same time! Hooray to working in a school. So I currently having three weeks off. I go back to work on the 20th April; I am so excited to enjoy three weeks doing absolutely nothing apart from whatever I want to do. However in the process I do need to write 2000 words of my final essay for my second year, ugh. I'd absolutely love to know what you all have planned for April. Anything exciting? Any changes happening in your life? I'd love to know! I'm planning on starting over Alexa Jean's workouts again on Monday (3rd April). After speaking to someone who has completed three rounds of her sore to the core routine, I had to motivate and push myself to do this no matter how crappy I'm feeling. I also planned on joining a gym on Monday however I don't want to go alone and my boyfriend doesn't want to join a gym right now; ah well. There's loads of time to join the gym. I no longer have to go into University for the rest of my second year. My deadline is the 12th May however I'm handing my essay in on the 24th April; I'm so excited to get them done and dusted and out of the way. However, I do need to start planning my dissertation but I do not have a blimming clue what I want to do mine on. If you've studied anything childcare related at University and you've finished your course then please give me some dissertation ideas! I'm starting the first day of April off by having a spring clean of my bedroom and clearing out everything I haven't touched in over a year. If I haven't touched it in over a year then there's absolutely no way I'm going to use it again. I need to stop keeping things which I want but never use and my wardrobe is the worst for this! I hope you all have a lovely start to the new Month, even though it looks like it's going to pour down with rain!